Rarely does an opportunity to own an architecturally significant home arise. 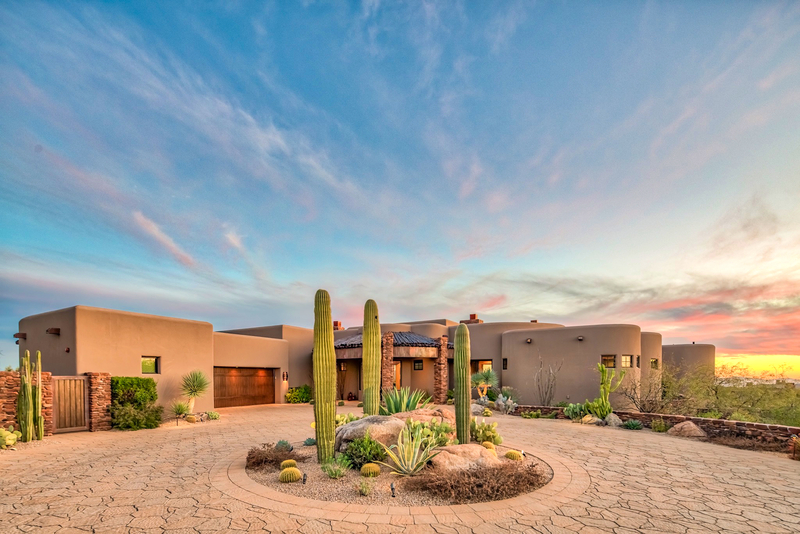 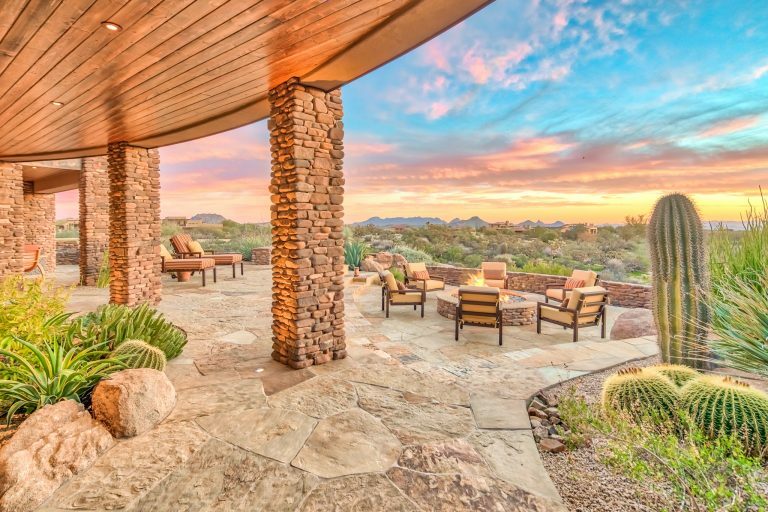 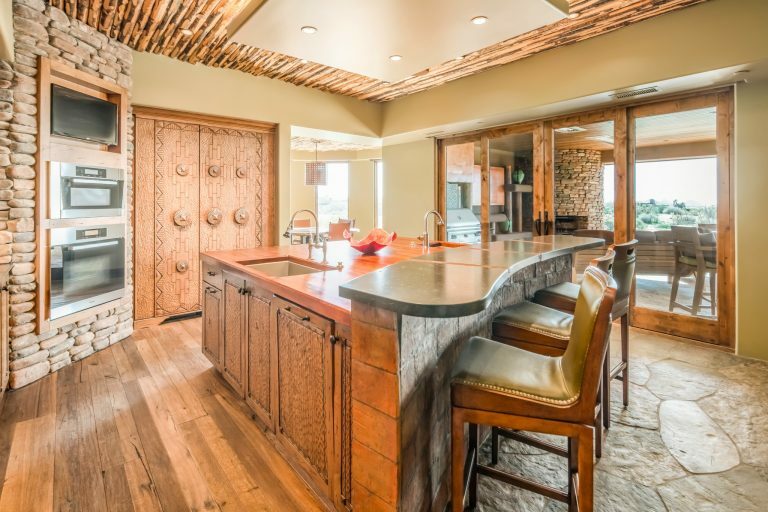 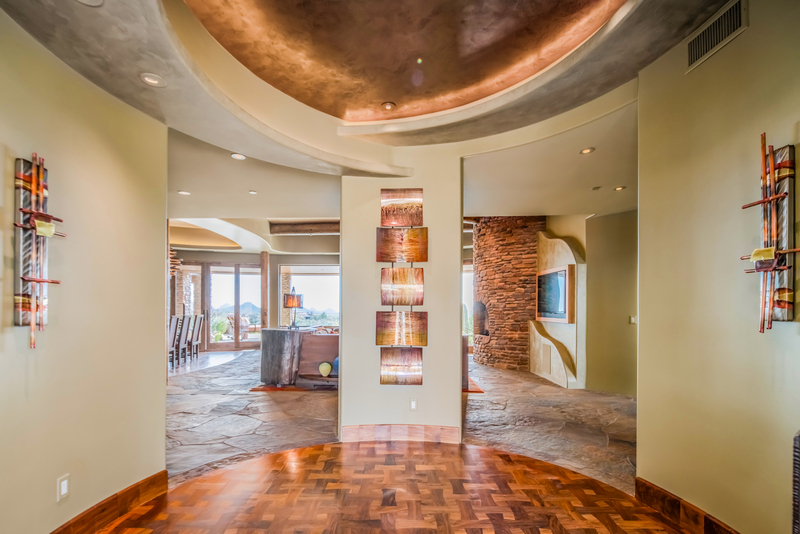 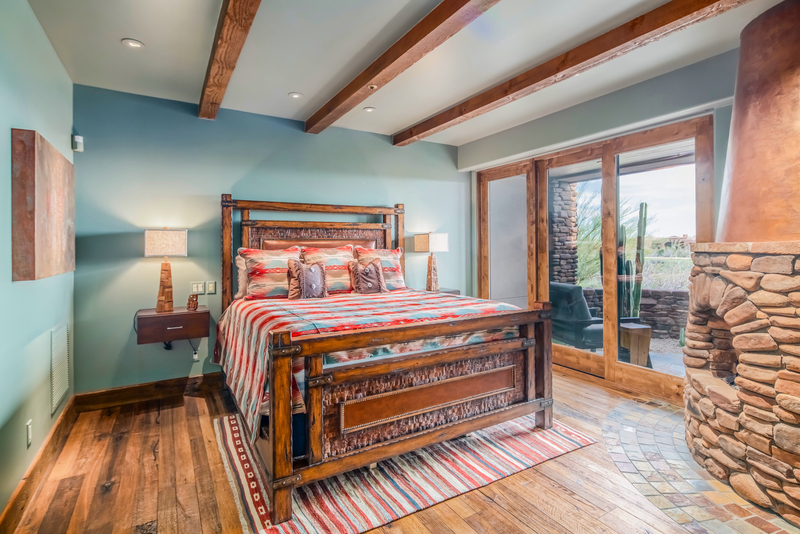 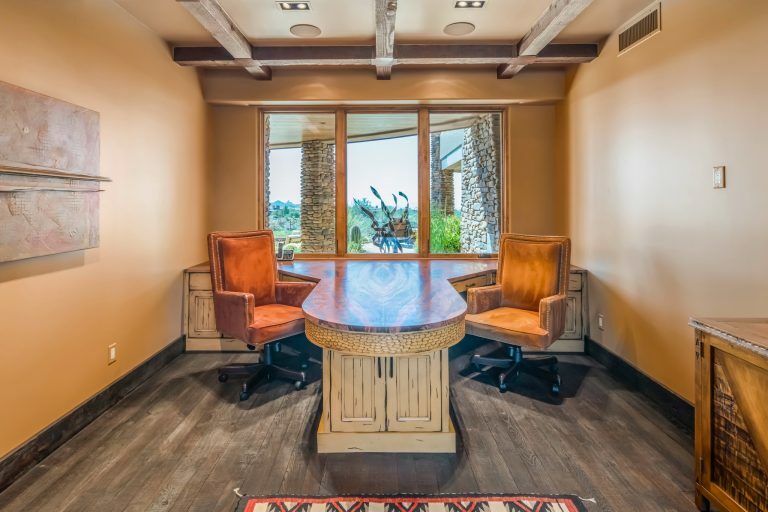 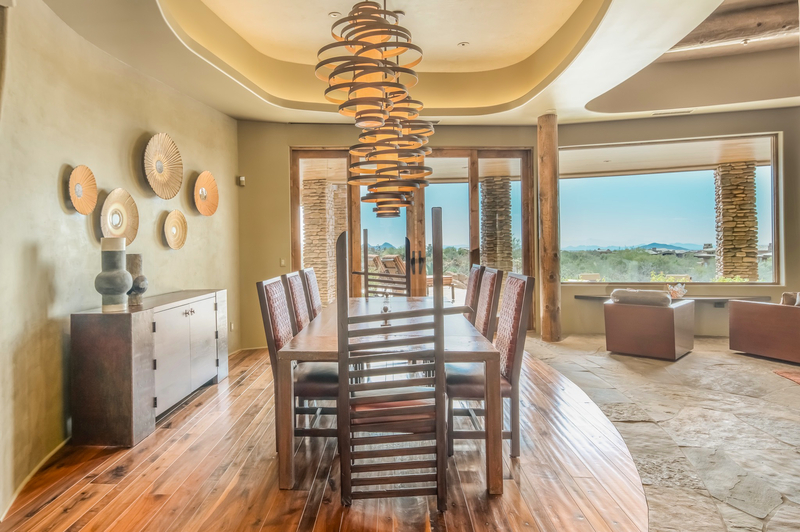 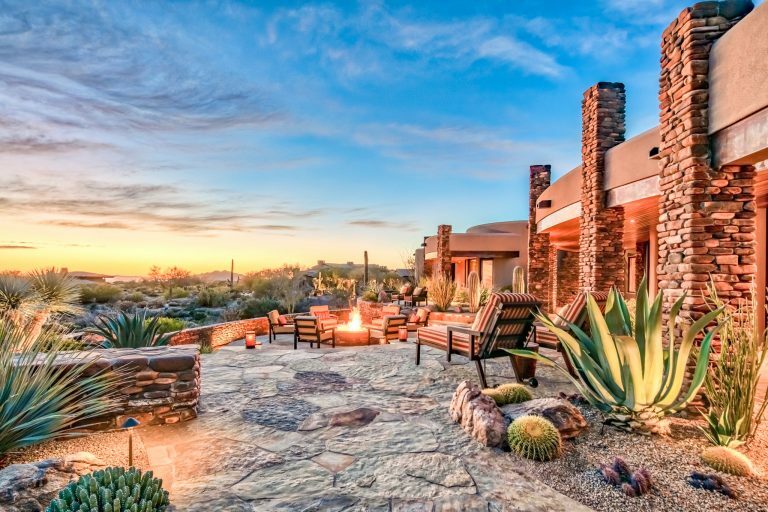 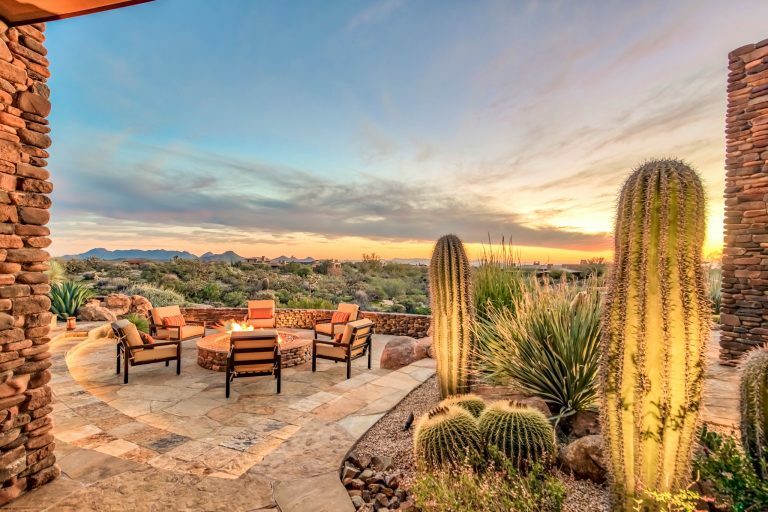 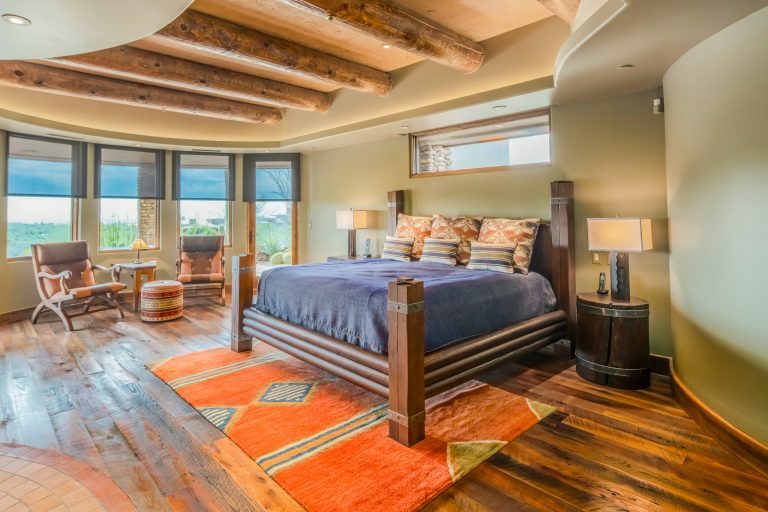 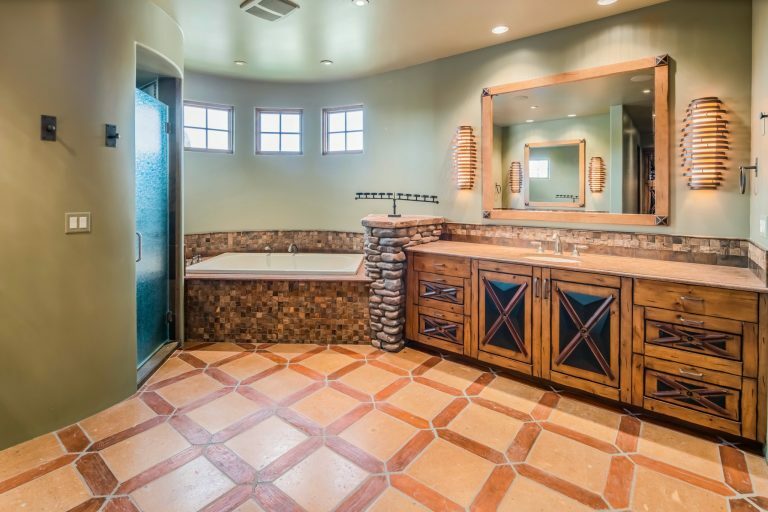 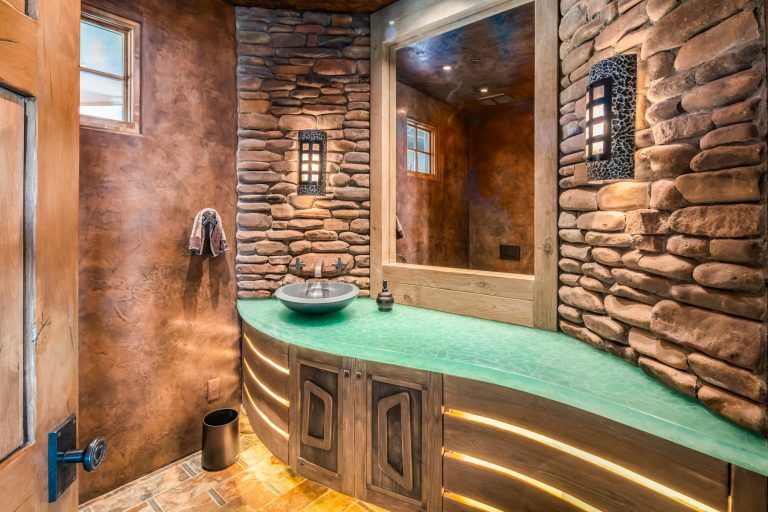 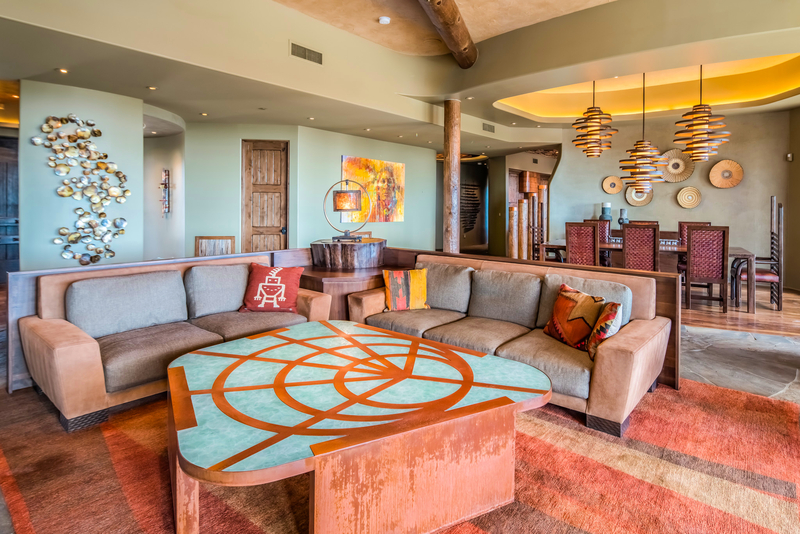 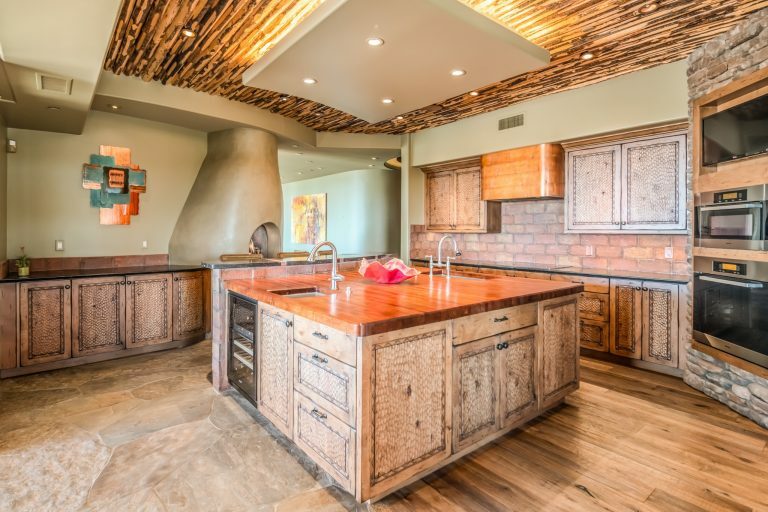 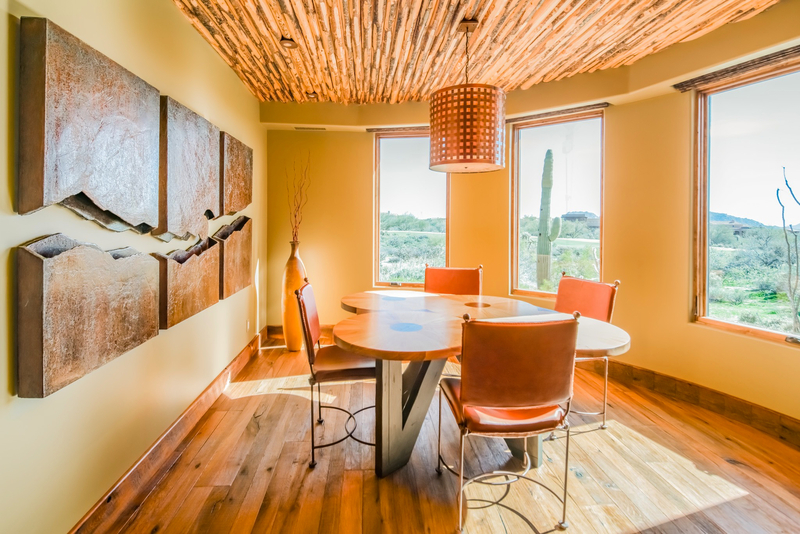 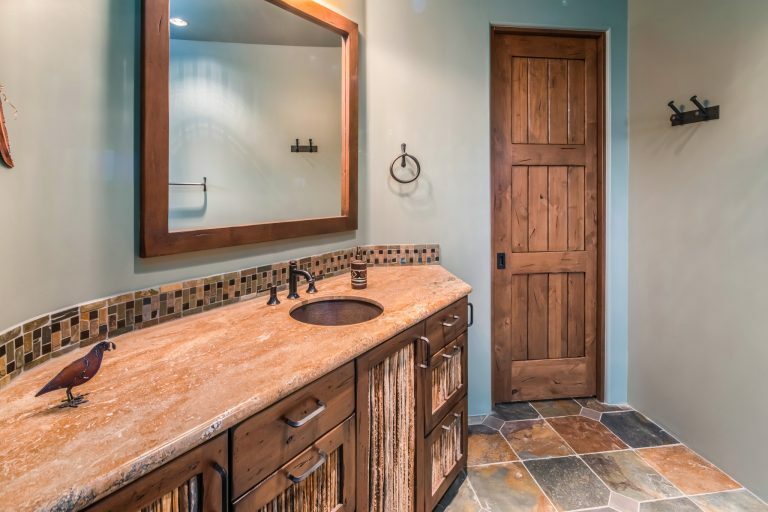 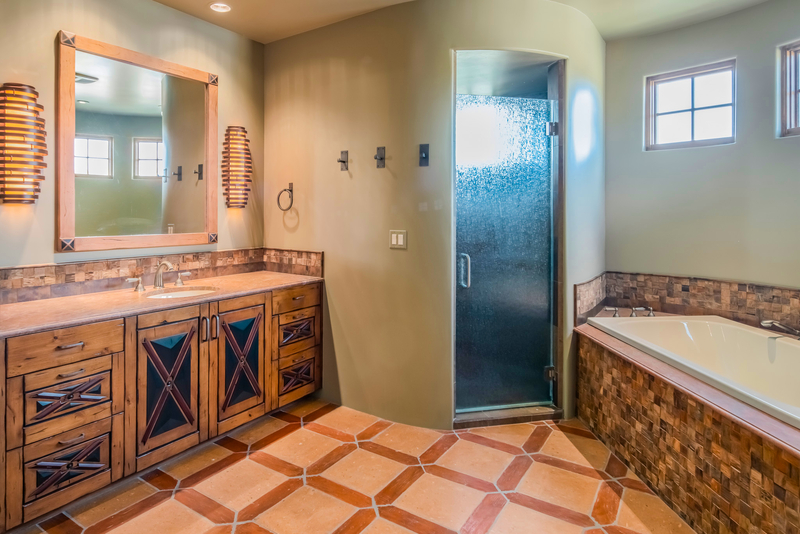 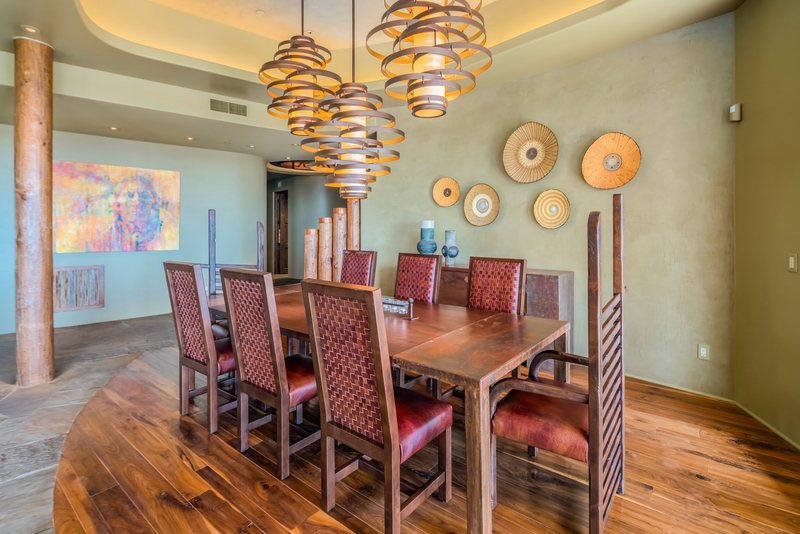 Designed by ‘Master of the Southwest’ architect, Kilbane Architecture, Sun-to-Sun is offered with custom designed furnishings and fixtures complementing the home’s organic pueblo style and will convey. 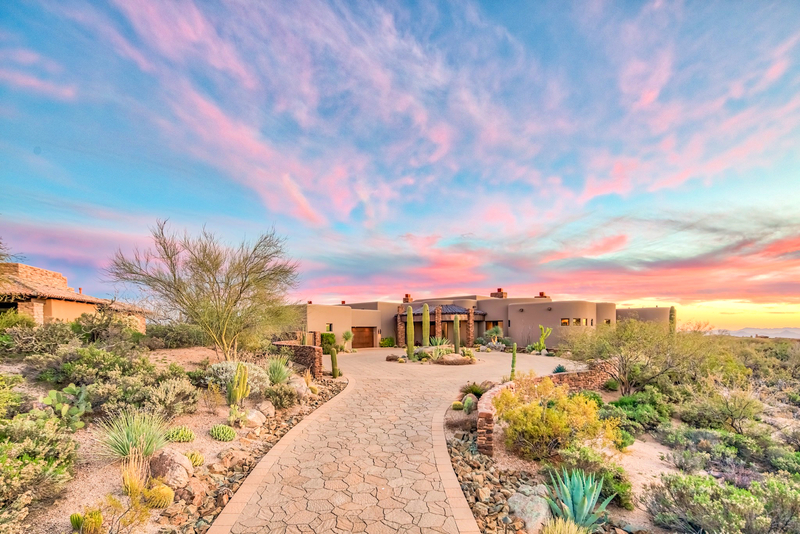 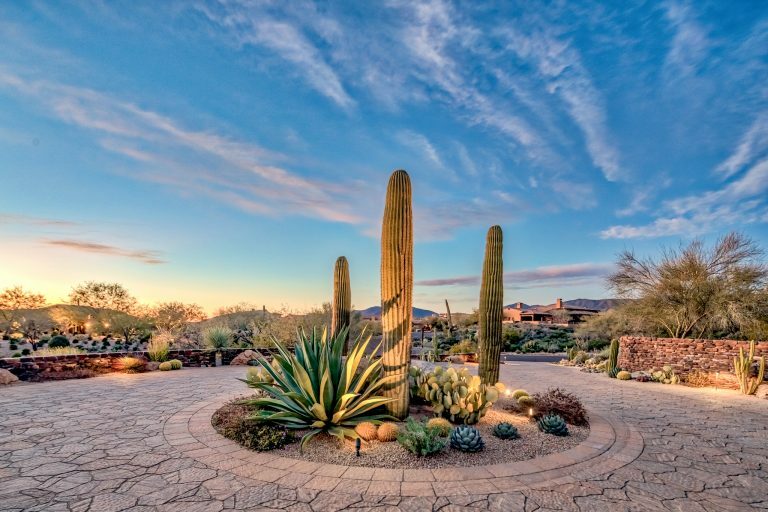 Located in the gated and guarded North Scottsdale community of Mirabel Club, this home excels on many levels. Kilbane Architecture was charged with designing a home along the 7th hole of the Fazio designed golf course that respects territorial heritage, with a nod to contemporary design, and the need to protect the down valley views. 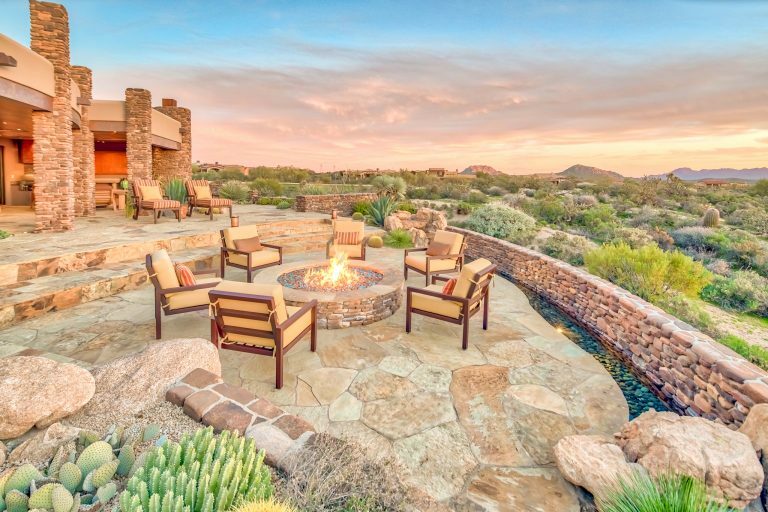 The owners carefully selected two of Mirabel Club’s finest lots at an elevated location and combined them into one large corner lot. 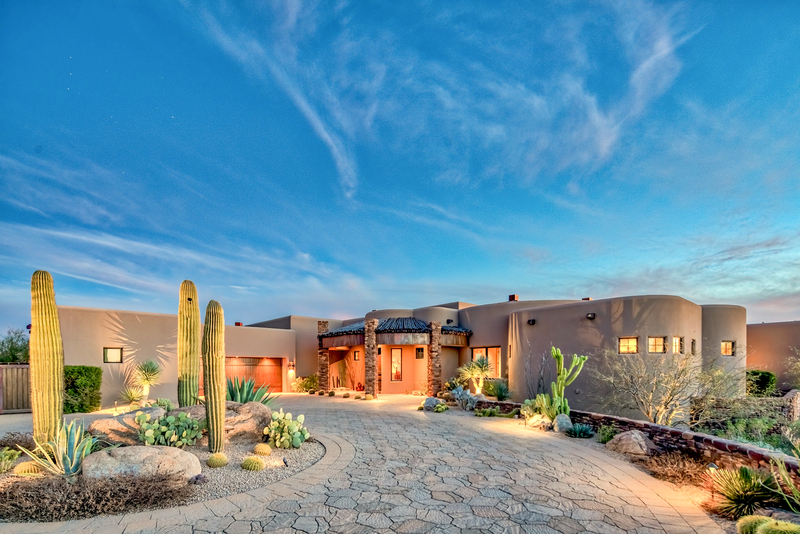 More than half of the building envelope remains available for expansion. 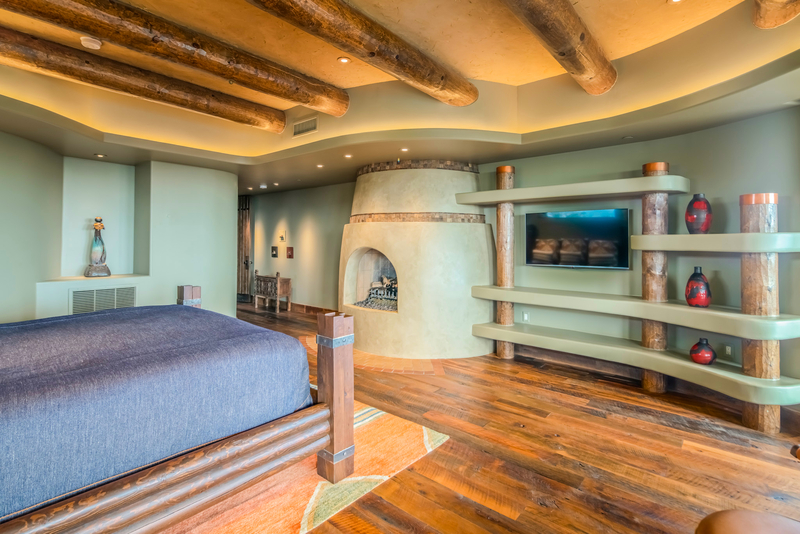 There are six kiva fireplaces, including one in each bedroom, as well as an oversized fire pit to provide ambiance and warmth. 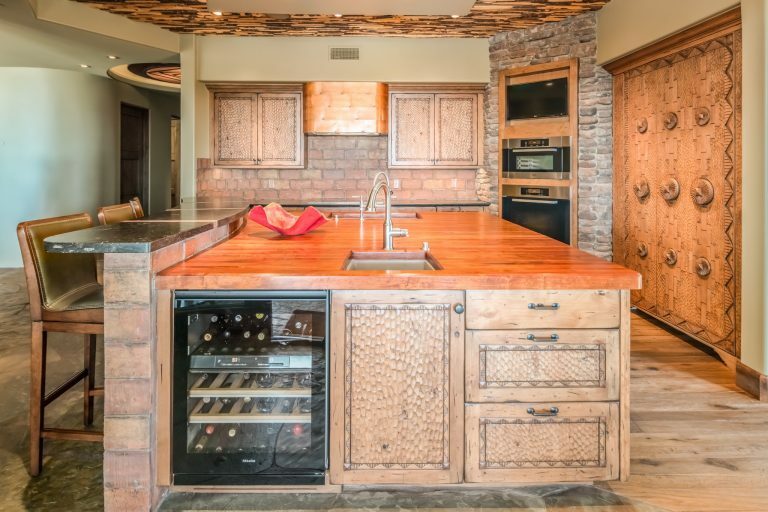 The kitchen features Miele appliances and two sinks that allow cooks to divide and conquer, and bartenders to serve and please. The countertops are a combination of beautiful walnut butcher block and fossil granite sourced from Belgium. 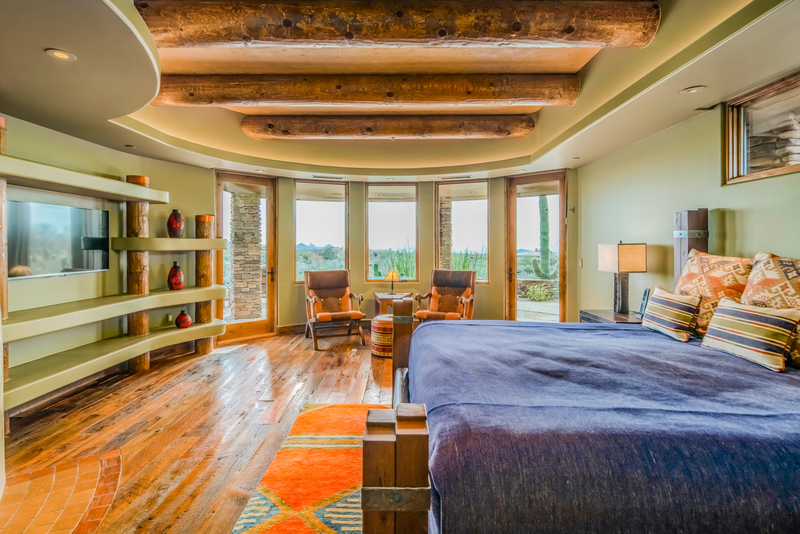 The Master Bedroom features a private patio that offers colorful sunrises and expansive valley and city light views. 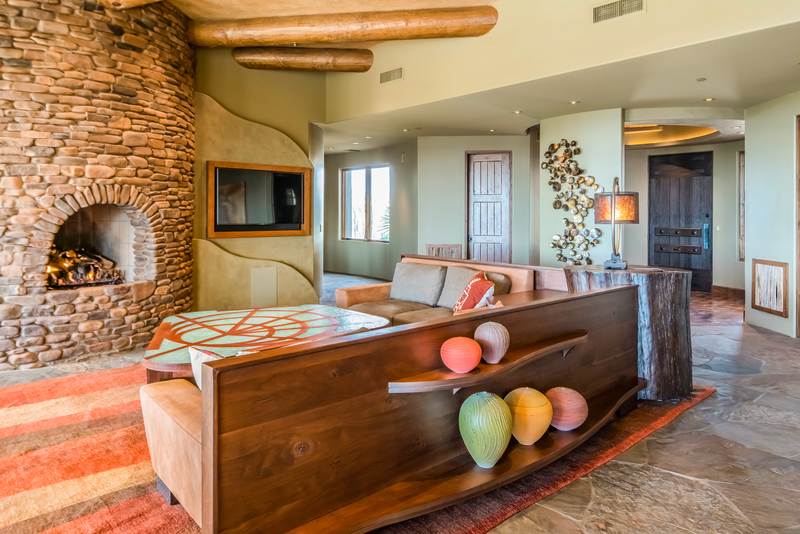 Another of the unique kiva fireplaces ensures cozy evenings during cool winter nights. 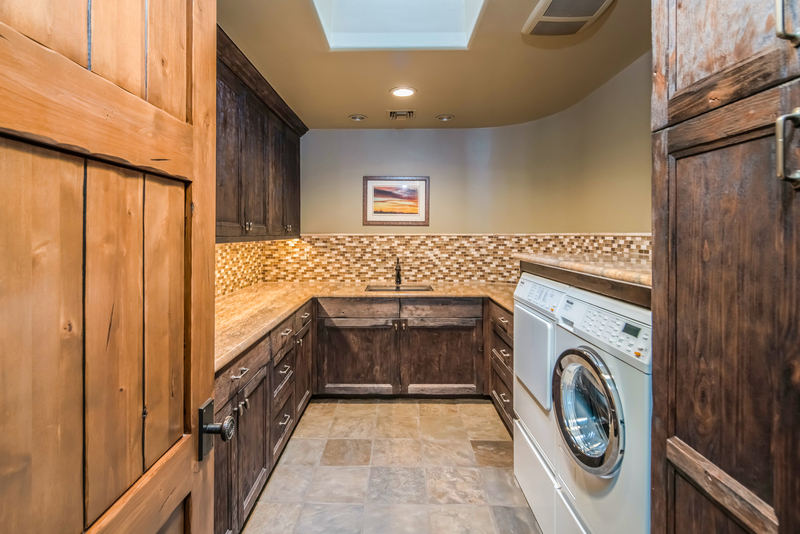 Floors in the bedroom and large walk-in closet are reclaimed Kansas barn wood. 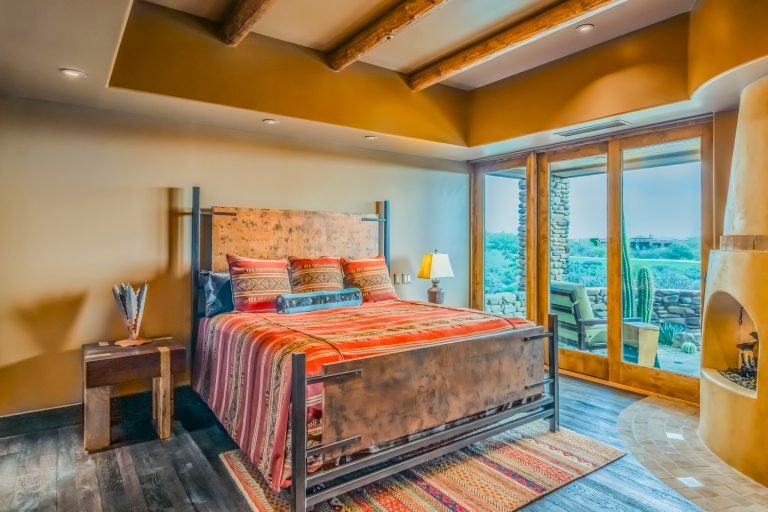 The two guest suites feature a large walk-in closet, fireplace, TV, doors exiting to private patio, and en-suite bathroom with custom stone and tile floors, and finishes that will remind you of the finest resort. 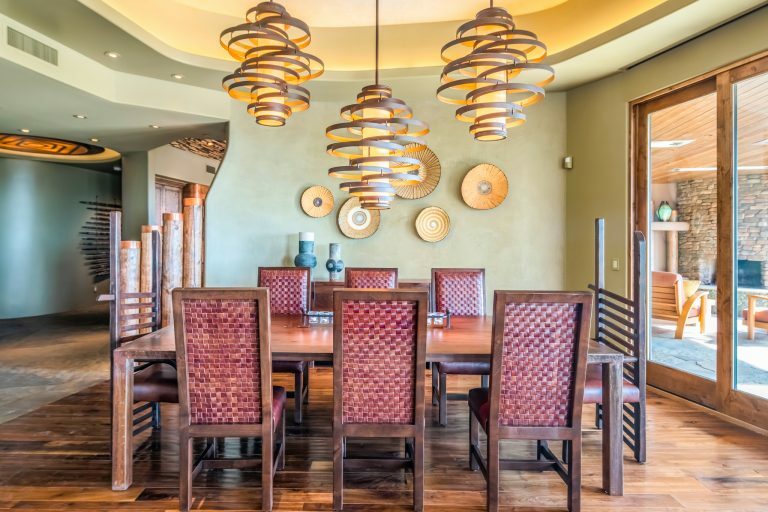 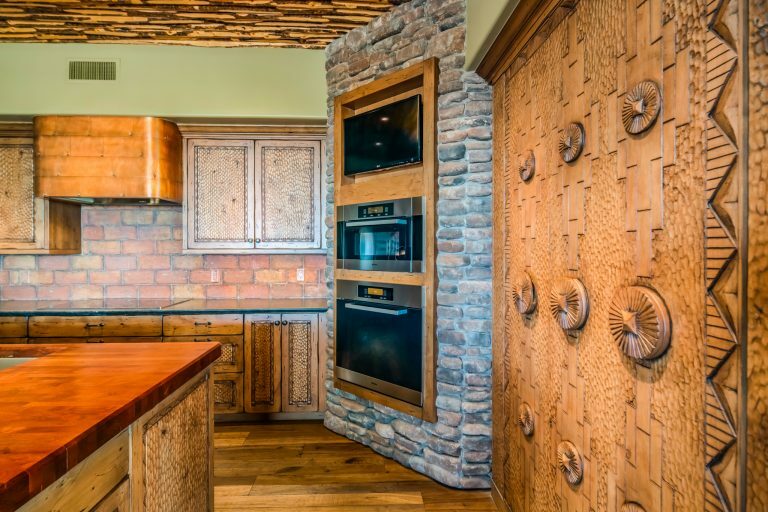 This home was crafted by artisans using unique materials and techniques rarely seen in home construction including spoon chisel cabinets and accents, baseboards, spa-like tile floors and showers, custom designed glass chandeliers and much more. 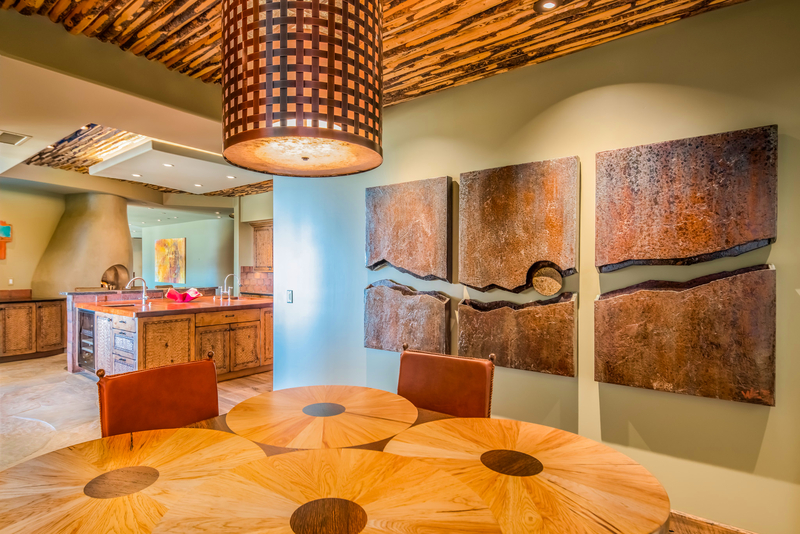 Local artist’s provided art and sculpture throughout the home, most of which will also convey with the sale. 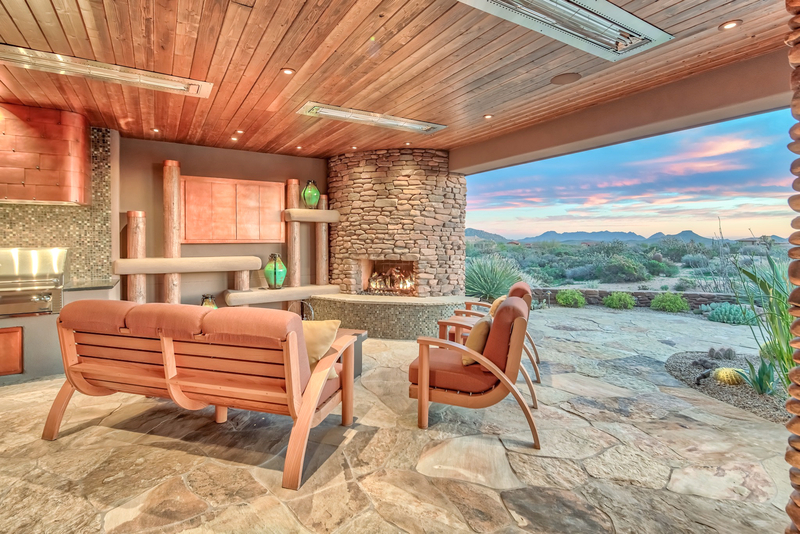 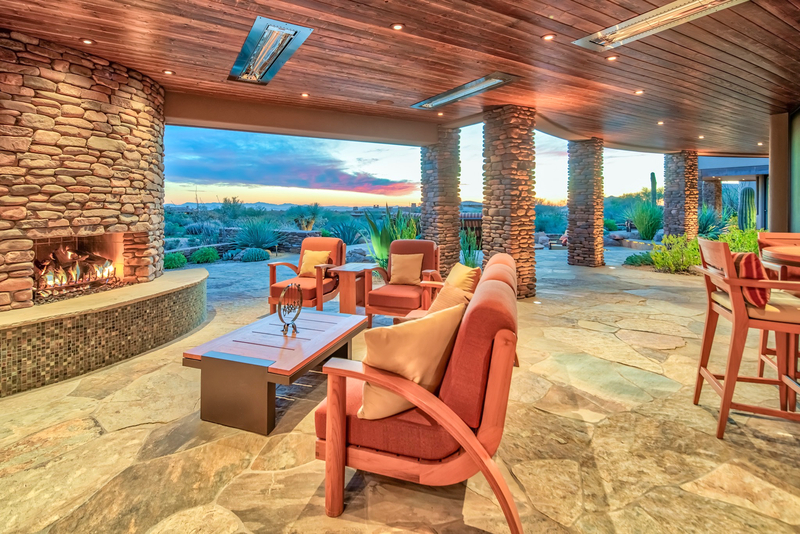 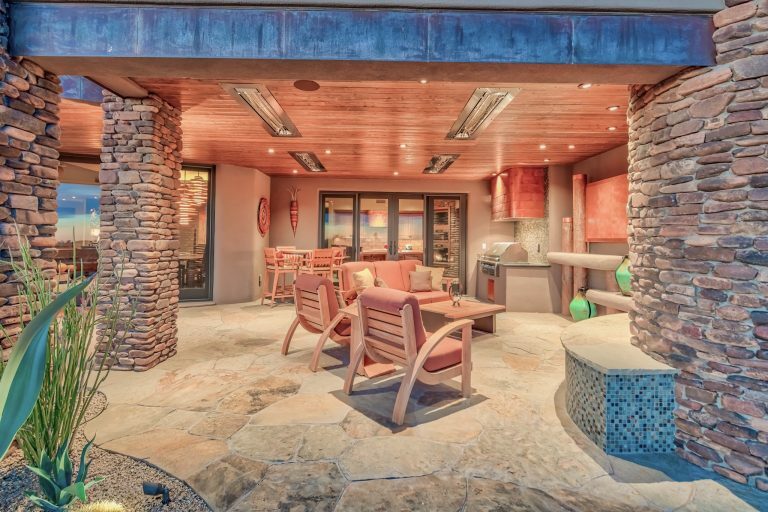 Indoor living flows seamlessly into a sheltered and heated outdoor cantina and features a TV hidden behind copper doors, fireplace, bbq with copper hood, and multiple seating areas. The outdoor space leads to a running water feature playfully named ‘Cave Creek’, a nod to the local community. 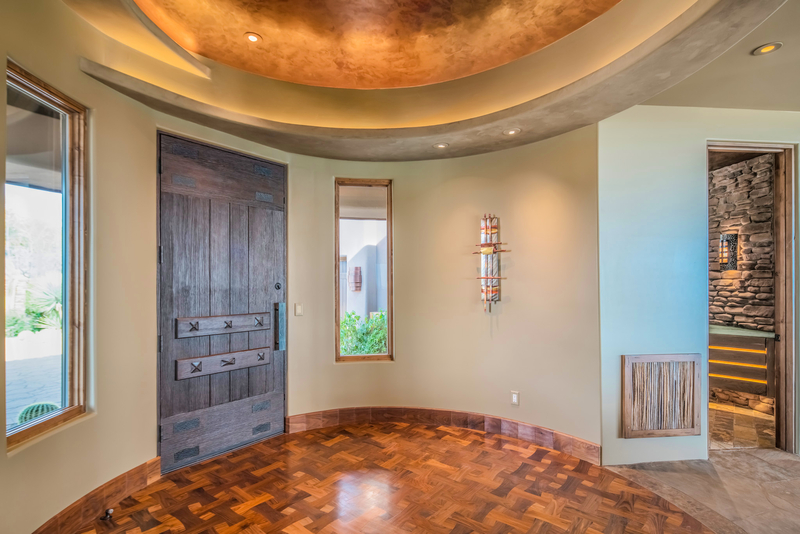 If you are searching for a home that offers exquisite quality, crafted in the old-world tradition and leveraging new-world technology, Sun-to-Sun welcomes you home. 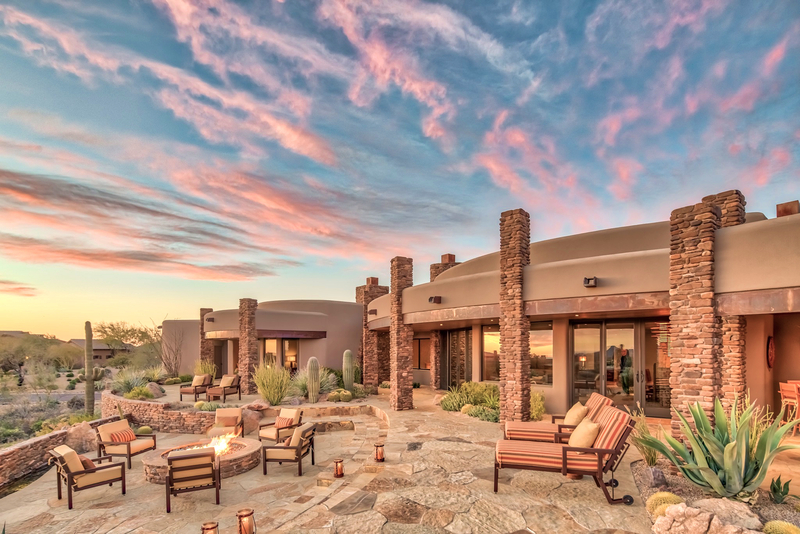 Visit Mirabel Club online for more information on the club and to learn about becoming a member. 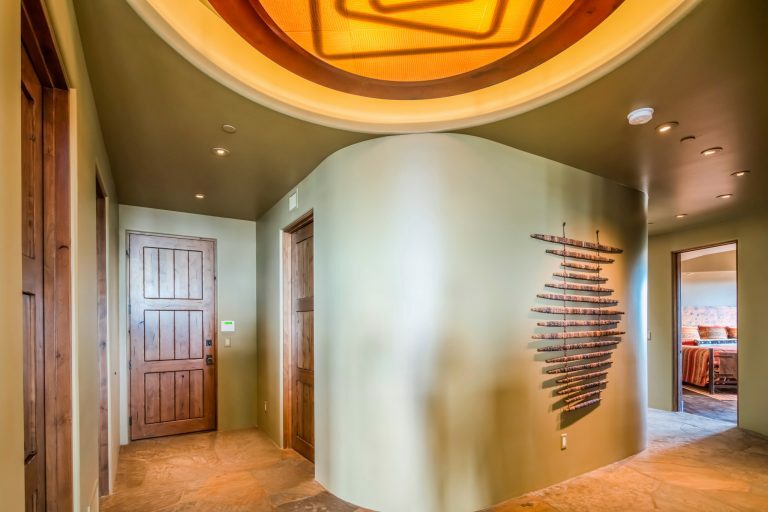 Click play above to view the property video. Click the square above to view the full property brochure. View the full 360 degree tour of Sun-to-Sun above. 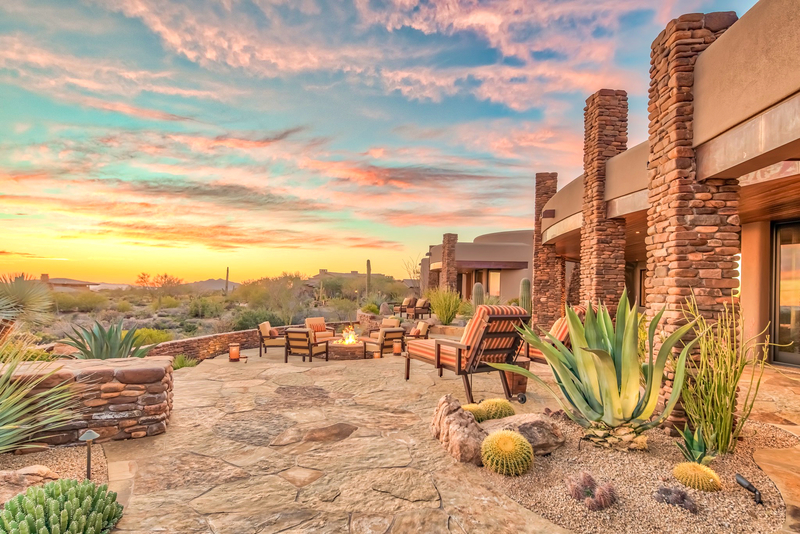 Click to watch a video provided by Mirabel Club on the Mirabel Lifestyle.